What does the team need in order to keep making high-quality action games? I think it needs skilled programmers and staff members who know a lot about action games. I think the enjoyment of action games lies in what the players feel through their hands, but I can’t explain it in words very well. That feeling of how gameplay feels with your hands is achieved by experience accrued up to that point and the conglomeration of lots of know-how. That’s right. For example, Kamiya-san has received a reputation globally for making incredible action games, but if you were to throw him into a company that never made action games, could he do the same thing? I don’t think so. 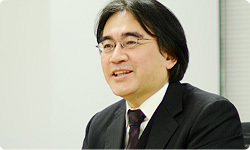 It depends on the team – on the staff seasoned in making action games. That’s why we’re able to make high-quality action games. 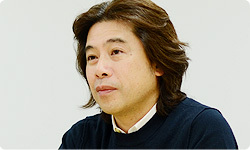 PlatinumGames started with a group that, as a matrix, could do that from the very beginning. Yes. At first, we started with about 60 people, and now we’ve grown to about 150. If we include all the operating staff, we’re on a scale of about 200 people. But we’re down to about half of the members who were there from the start. Yes, we’re down to about 30. But those 30 form the backbone. They train the people who come in each year in the ways of PlatinumGames and pass on their know-how, and that’s how we expand. Can you pass down that know-how smoothly? Well, if you make a game company and suddenly increase the number of people, the know-how can’t be passed on that quickly. We think it’s important to hire new graduates, and we make a point of hiring about ten new graduates each year. I’m sure there are many companies that only hire people with experience, but I think there’s a high possibility that the new graduates have a higher chance of being the ones to carry PlatinumGames into the future. Does that mean that while you may want immediate firepower, a blank slate is better for learning the PlatinumGames style from the core? Yes. It’s like special education for the gifted. Of course, nothing says that mid-career people can’t handle that, but we want to raise with our own hands those people who will carry the gaming industry into the future. When we talk about raising talent, some things can’t be conveyed in words but only gained through direct contact. For that reason, after they enter the company, they mix in with a team and look over their senior co-workers’ shoulders and watch magic-like operations they don’t understand and think, “How is she doing that?” It’s how people used to learn their jobs. In that respect, it’s like the way groups of artisans teach their craft. 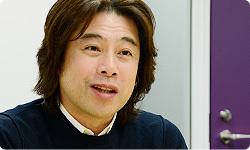 But the way PlatinumGames work suits some people and not others. Anything past 90 progresses at a snail’s pace. But some people are thrilled, like, “Oh, I get to run more! This is fun!” Those people are suited for PlatinumGames. Yeah. Because everyone is always running. In the end, those people who can run, those who fit, stay, and the company gets stronger. But it may not be good for the company to get so concentrated like that. You’re becoming purer platinum! (laughs) Okay, to finish up, I’d like you leaders of PlatinumGames, which is always on the run, to say a little something to the fans. Considering my personality, I don’t think I can stop trying new things or pursuing the unprecedented. PlatinumGames has even included the idea of high quality in its company name, but I want to continue to value that sense of excitement that comes from never knowing what may happen. I will work hard so that people will experience a fresh surprise and say, “Oh, so this is what’s next!” And I want to work hard to respond to those expectations in the title that follows the one announced and the one after that, too. It’s often said these days that Japanese industries are looking sluggish. But I don’t think so. With what we make, I want to show the world the strength of what it means to be made in Japan and to play a part in that work, and I think that has great significance for developing PlatinumGames on a worldwide scale. As a result, having people say, “Japanese games really are great,” was one of my purposes in founding PlatinumGames, so my goal is to achieve that. As you just mentioned, some people say that Japanese industries are done for, or express somewhat negative opinions about dedicated game machines, but I don’t agree in the slightest. The environment changing with the times and being pessimistic about our own future are completely different things, so if we find and present the spirit of those times, that right environment, we will definitely thrive. That’s right, blaming the times is just an excuse. So we strongly want to be a studio that can win with games that are made in Japan. I truly want us to do our best so as not to betray expectations and so as to get results. 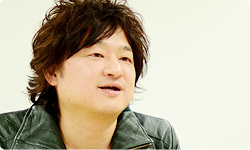 Perhaps Kamiya-san will come next time. Yes, it looks like I will first talk to Kamiya-san on The Wonderful 10123.23. 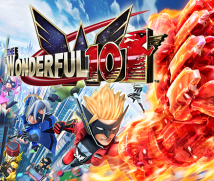 The Wonderful 101: A completely new action game by game designer Hideki Kamiya that is in development to be released for Wii U. Its release date is TBD. (laughs) Thank you for today.